Chipboard and OSB - the materials are quite different in their parameters, so their areas of application are different, although in some cases they overlap. To understand what is better chipboard or RSD, we will make their comparison by the most important parameters. To begin with, the definitions. Chipboard is a chipboard made by pressing from arbitrary shaped wood chips. OSB is a wood board, for the manufacture of which special-shaped chips are used, which are oriented in certain directions before forming the plate. The plate consists of three layers. In the outer layers, the chips are oriented in the same direction in the plane of the plate, and in the middle layer - perpendicular to the outer layers in the same plane. 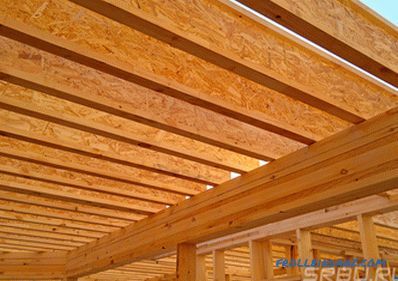 The name of the OSB is derived from the transliteration of the English name Oriented Strand wood construction Boards (OSB). Along with them, the Russian-language term and the corresponding abbreviation is used - Oriented-Chipboard (OSB). Both compared materials are composites based on wood waste. They are made in the form of sheets or plates of different thickness and size. In both cases, the plates are formed from wood chips using formaldehyde resins. This is where the main similarities between them end. The main difference between OSB and DSP is seen from the above definition. This is a special form and orientation of chips. 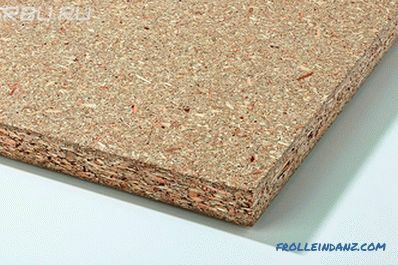 Particleboard is produced from 1 mm and above, in 1 mm increments. Most often plates 10, 16 and 18 mm thick are applied. These are furniture standards. The most popular sheet formats are 2750x1830, 1830x2440, 2800x2070 mm. But a lot of options, starting from 1800 in length and 1200 in width. OSB has a thickness of from 6 to 40 mm with a step of 1 mm. The most commonly used formats are 2500x1250 and 2400x1220 mm, although there may be a variety of options. The minimum size defined by the standard is 1200 mm. In addition to the usual rectangular sheets with a smooth edge, tongue-and-groove plates are made, which are conveniently used as a covering. When they dock, the profiled edges form a lock, aligning the adjacent panels in one plane. According to their physical and technical parameters, each of the materials is divided into grades or types. 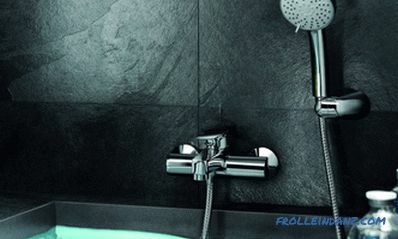 type P2 - for dry indoor conditions , including for the manufacture of furniture. OSB-4 - for wet conditions at elevated loads. By comparison, we will focus on the materials most often used - this is particleboard P2 and OSB-3 15–18 mm thick, based on GOST 10632-2014 data (Wood chipboards) and GOST R 56309-2014 (Construction wood boards with oriented chips). The main strength parameters for wood composites are the flexural strength, the coefficient (modulus) of elasticity and the strength of fasteners retention. 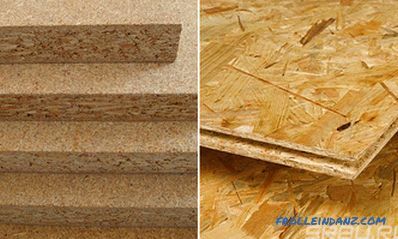 Since the OSB consists of large chips, which, due to their orientation, form a certain structure, higher strength values ​​can be expected from these sheets. But let us turn to the specifications of the GOST. specific strength of screw retention - 35-55 N / mm. fastener retention strength: 80- 90 N / mm, and in some manufacturers - up to 112 N / mm. 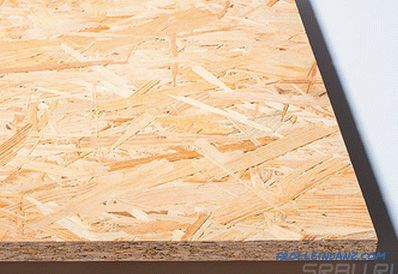 The OSB plate is 1.5–3 times larger than the particle board in mechanical parameters, although with loads across the external structure it is slightly inferior. The resistance to wear of the compared materials is entirely determined by the surface structure. Chipboard consists of small chips, which is quite easily painted out under abrasive loads. And since the outer layer has the highest density, the wear rate increases with time. On the surface of the oriented strand board, most of the area is occupied by large chips with intact wood structure. When abraded, it is almost not damaged and is able to withstand heavy loads. When choosing which is better to lay on the floor, chipboard or RSD, the answer will be in favor of RSD.However, it should be remembered that none of these materials is intended for use as a front, finishing layer of finish, so their durability is not standardized, but only determined from practice. What material is more resistant to moisture? In wet conditions, the chipboard loses strength very quickly, and when strongly moistened, it is completely destroyed. OSB-3, when tested for moisture resistance, is placed in room temperature water, the bath is heated to 100 0 C for 90 minutes, held for 2 hours, and then cooled to 20 in an hour 0 C. After drying, the sample shows bending strength along the main axis of 7–8 MPa. That is, its strength decreased by about 2.5 times, but the sample retained its integrity and part of its structural strength. burns almost completely, with the destruction of the sample. The degree of fire hazard of the materials is the same. 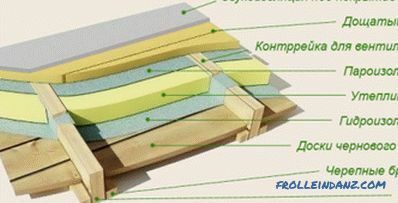 Binders based on formaldehyde resins are used in the manufacture of wood composites. These resins continue to emit volatile formaldehyde, which is harmful to health, even after the completion of the process. All composite materials of this type are divided into classes according to the intensity of formaldehyde emission. The lower the grade, the safer the cooker, regardless of its type. 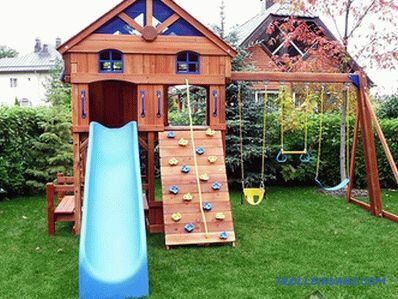 All the arguments about where the resin is more and where it is less, which is better, chipboard or OSB in this regard, are divided into GOST figures. When the formaldehyde content is not higher than 4 mg per 100 g of dry material - the plate belongs to the class E0.5. With a content of 4 to 8 mg / 100 g - the material is of class E1. Up to 20 mg / 100 g - class E2. These figures are the same for both materials, which means that the choice of the degree of environmental friendliness comes down to choosing the desired emission class. Materials of class E2 are prohibited to use in residential areas. Classes E1 and E0.5 are approved for the production of furniture, the manufacture of any designs and skins in residential premises. As regards environmental friendliness, the chipboard and oriented chipboard plates do not differ from each other. In our case, manufacturability means usability. Let's try to analyze this quality by the example of different actions. Wood boards are stored and transported in the same way. The only difference is laminated chipboard. It requires careful handling in order not to damage the decorative layer. These sheets are cut in the same way, with the same equipment and tools. 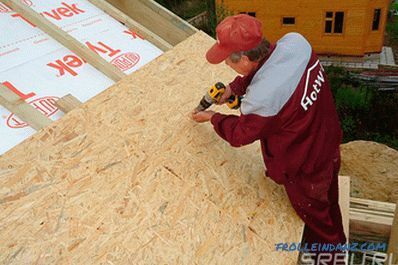 When cutting with a manual jigsaw on OSB, large flakes may appear due to the structure of the material. When fine-tuning the shape of parts with a belt grinder, OSB may require more work. 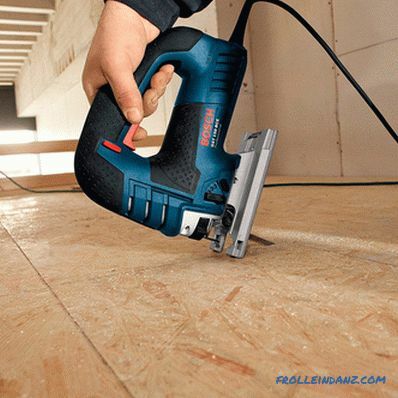 When drilling holes in the OSB, flakes may also appear that are missing or almost missing on a chipboard. For some cases this is important and must be taken into account when working. 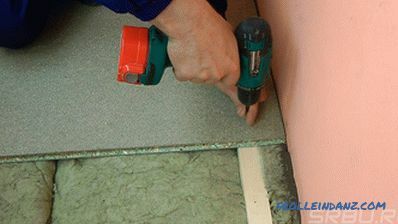 Self-tapping screws (screws with a sharp end) enter the chipboard without a prior drill. In OSB - also included, but it requires an effort close to the tensile strength of the screws. Pre-boring may be required to install the fastener in OSB. When installing screws with a countersunk head in OSB, countersinking is necessary. In many cases, it is not required in the particle board - the head is sunk due to the flexibility of the material. By manufacturability, a slight advantage remains for the chipboard. Compare the price per square meter of materials of approximately equal thickness. Chipboard thickness of 16 mm is 110 - 180 r / m 2 . OSB-3 with a thickness of 15 mm - from 235 to 295 p / m 2 . Taking into account the difference in thickness, we can conclude that OSB-3 is almost twice as expensive as particleboard P2. When compared with non-moisture resistant OSB-2, the price difference will be reduced to 1.5 times, but this material is not popular. The fields of application of these materials are determined by their properties. The largest field of application for particle board is the production of furniture. They are laminated or veneered and, after lining, furniture parts are made. In the construction of chipboard is used as a structural material to create three-dimensional interior elements, to hide communications, to create any structures for which the use of plate materials is natural.These sheets sheathe frame construction, used as a material for the subfloor. DSP flooring on the floor. The scope of the RSD is shifted towards high humidity and high loads. 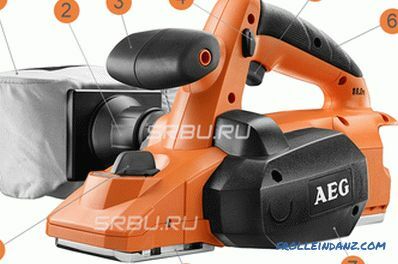 It is well suited for the manufacture of stairs and any loaded structures, such as ceiling beams or lag for the floor. The main difference is moisture resistance. 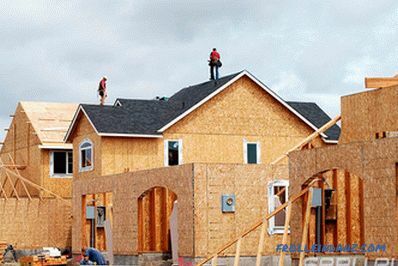 Thanks to her, OSB is used for covering frame houses, as a solid foundation for soft roofing materials, for temporary or permanent closure of openings, for making formwork. 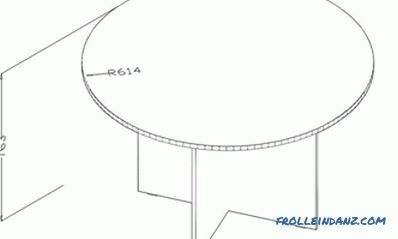 Patch of the base for a soft roof. Sheeting of the walls of frame houses.